It’s a phrase we ask when we feel like someone has been gone too long. Maybe we are looking for them and can’t find them. Or maybe it’s just become a normal thing that you see them and then all of a sudden you notice they aren’t there. 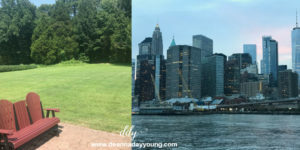 My husband, daughter and I took a vacation for a few days to New York City. I chose not to post much on social media while we were gone and just focus on our fun. Actually, (don’t tell anyone) but I didn’t even open up my laptop to do any work for my employer! YIKES! Although, I admit, I did check and respond to a few emails from my phone. It was a true vacation where my mind and body and spirit got to relax. I casually responded with a generic answer but truth be told my mind was starting to wander. I could feel this anxiety creeping in….back to reality. Back to stress at my job. Back to housework and laundry. Back to routines and cooking and cleaning. Back to posting and writing and speaking. And then I realized something. I love all that stuff (well maybe not the stress of my job but all the other stuff 🙂 ). I love writing and posting and speaking. I love taking care of my family by cooking and cleaning and doing laundry. My house and Indiana were calling my name. WHERE HAVE YOU BEEN? God was asking me the same question. Where have you been? Sure I had been reading my devotionals and praying before meals and off and on throughout the day sending up my requests. But the quiet time was lacking because we were on the go a lot and having a great time experiencing what NYC had to offer. But I realized that when I wasn’t taking time to write and do my daily morning studies that I had a real void. I was missing my time with the Lord. Sometimes we ask Him, “where have you been, Lord?” We feel like He left us all alone to do this life by ourselves but in reality it was us who went on vacation. It was me who went away for a while and got caught up in all this fun and forgot to continue with the one daily ritual that sets the tone for the whole day – quiet time with Jesus. There’s nothing wrong with vacation and fun but for me, I need this hour of quiet time. Yes, we had a blast and no I didn’t forget about Him. I still talked to Him and read my Bible. But I realized that I really did miss this morning ritual of writing and studying and praying deeper. If you talked to God today, would He ask you where you’ve been? If so, it’s rhetorical. No need to answer. He already knows. What He’s really happy about though is that you’re back and He can’t wait to spend some time with you. This entry was posted in devotional, inspirational, motivational, spiritual on August 3, 2018 by Deanna Young.